Background: Pentaerythritol (2,2-bis (hydroxymethyl) propane-1,3-diol) as white crystalline odorless solid has been synthesized in 1891. Pentaerythritol is multifaceted species in many compounds, which are wildly utilized in medicine and industry. 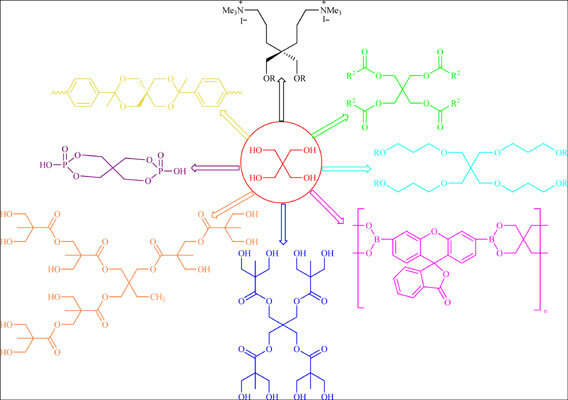 Also, multicomponent reactions (MCRs) play a crucial role in organic and medicinal chemistry. Hence, in these reactions, pentaerythritol is a versatile substrate for the synthesis of many polyfunctionalized products, because of the presence of the neopentane core and one hydroxyl group in each of the four terminal carbons. Objective: The review describes pentaerythritol multicomponent reactions in the presence of different solvents in the reaction medium to produce various compounds including pentaerythritols. This review covers the literature relevant up to 2018. Conclusion: It is obvious from the provided review that a great deal of research has been done in this field, utilizing various mediums (solvent-free conditions, aqueous media, and organic solvents) for the synthesis of the products of containing pentaerythritols. This classification is based on the importance of economic and environmental friendly reactions. Due to the whole aforesaid reports, some reactions required heat for their progress, and some others were accompanied by microwave or ultrasonic waves. Pentaerythritol, reaction media, solvent-free, aqueous, multicomponent reactions, organic transformations.